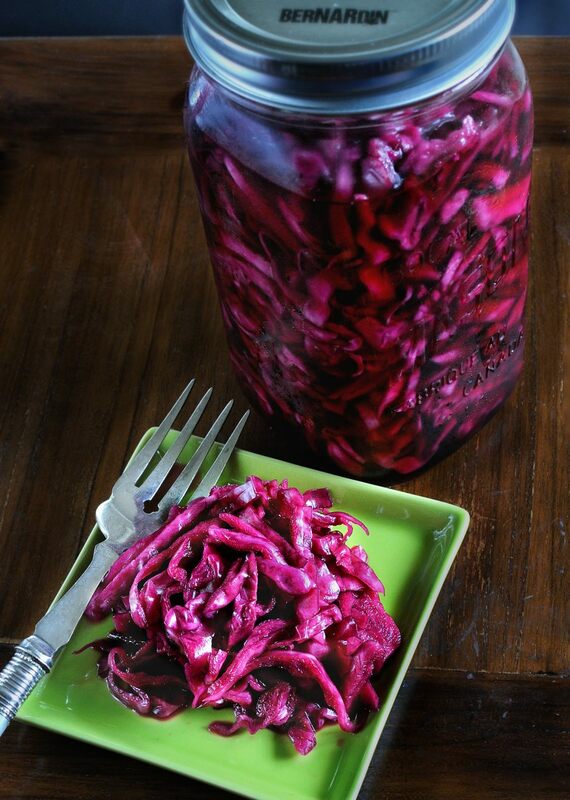 Hawksmoor’s Pickled Red Cabbage :: Oracibo.com - Food, Travel, Design and Cooking! A recipe from the Hawksmoor At Home cookbook that’s become a standard fall thing at #5! We are giving this recipe a definite two thumbs up! The restaurant “Hawksmoor” is a London Steakhouse just around the corner from the Guildhall and I can tell you the next time we are in London, we will be beating a path to their door! Here’s a quote from Heston Blumenthal: “at the heart of Hawksmoor is the sourcing, preparing and cooking of great British ingredients.” This is for all you naysayers about British food! Using a mandolin or a very sharp knife, finely slice the red cabbage into ½ or 1” strips. (I prefer it sliced into ½” strips). Place the cabbage on a rimmed baking tray or roasting tin & cover with the salt, mixing them together well so that the salt doesn’t just sit on top of the cabbage. Set aside for 3 – 4 hours. Next make your pickling syrup. Place the liquid ingredients into a medium-sized saucepan, add the sugar & bring to a boil. Reduce the liquid by half, then turn the heat down to a simmer & add the spices & bay leaf. Cook for a further 10 minutes over low heat, then allow to cool for 5 minutes off the heat before straining the spices from the syrup. Set the syrup aside to get cold. Rinse the salted cabbage well under cold water to remove excess salt & liquid. 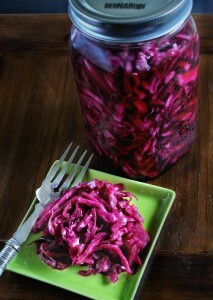 In your sterilized jars place the rinsed cabbage & cover with the pickling syrup. Stir once or twice to make sure all the cabbage is coated in syrup, then seal & refrigerate for a week or longer. We’ve found the longer it stands the more the flavour develops. It will keep in the fridge for several weeks. To Sterilize the Jars: Fill a large pot with water & bring to a boil. Place thoroughly washed & dried jars into the pot, cover the pot & turn down the heat to medium ensuring that the pot is still slightly boiling & sterilize the jars for a minimum of 10 minutes. Leave in the water until ready to use, simply turn down the heat to simmer until you need them.